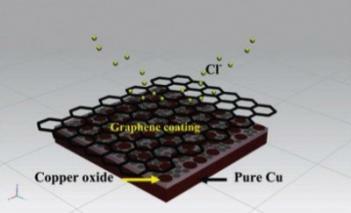 Researchers from Monash University and Rice University developed a thin graphene film anti-corrosion coating. Their new coating can maker copper more resistant to corrosion - almost 100 times better than uncoated copper. According to the researchers, that's the best graphene-based anti-corrosion material developed yet. The researchers are now looking at different metals to coat, and are also investigating ways of applying the coating at lower temperatures (currently they use CVD at temperatures between 800 and 900 degrees). This is not the first time we hear about graphene-based anti-corrosion coating. Back in may 2012 researchers from the University at Buffalo developed their own graphene-based anti-corrosion coating, although we do not know how it compared to the new one developed at Rice and Monash.